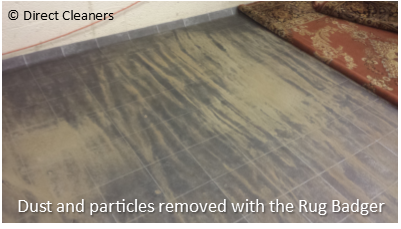 One of the most important procedures in rug and carpet cleaning is the dry soil removal process. That is to remove all the loose dust, sand, grit and partials that are trapped deep in the rug or carpet fibre, before even a drop of water or cleaning solution is used. Unfortunately, most rug cleaners do not this this vital rug cleaning process! Traditionally the rugs were hung and beaten with hand-held carpet beaters to remove all the dry soil trapped within the rug. As you could imagine, not only would this be very hard work, but it would also be very time consuming. We’ll thankfully there is! We’ve taken the principle of the traditional way of removing the soil, and brought it into the 21st century. The secret is an amazingly simple but hugely effective rug dusting machine called The Rug Badger. 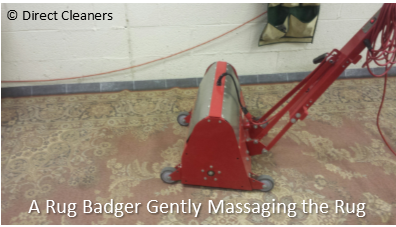 This machine uses many soft leather straps to harmonically vibrate and beat the rug that acts like an “army of gentle rug beaters” carefully loosening deep down dust, dirt and soil out of both the front and back of your rug. As you can see from the photos, it is absolutely amazing what is removed from the rug, or what is in rugs… just from this single process, we will have already removed about 80% of the soil within the rug. And the best thing is, the rug hasn’t even got wet yet! We use a full nine step process to fully clean a rug in Wimbledon, the Rug Badger process is just one of them. I will be speaking about the other steps in future Blogs. 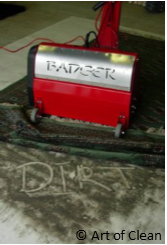 But if you are looking at getting you rugs professionally cleaned, make sure your rug cleaner is using something like a Rug Badger machine, otherwise you may not be getting as good clean as the rug needs or deserves.